The Walther Model 9 vest pocket pistol was a very successful design that was manufactured for over two decades. During this time the designers and engineers at Walther were continually making changes to the pistol’s original design in order to improve the little gun’s function, market appeal, and ease of manufacture. These changes provide today’s collector with a rich variety of collecting options. Each type and sub-type of Model 9 has a separate and distinct appeal. This article provides a general outline of the variations, followed by a list that details the distinct Types and the numerous sub-variations of the Walther Model 9. Model 9 Walther Types are based upon significant design changes that were made to the pistol at two points during the 20+ years of production. Around 1924 and again in 1934 (or possibly 1935) the designers at Walther made significant alterations to the fabrication and mechanical function of the pistol. These changes establish three distinct Types of the Model 9. Also during the production life of the Model 9 there were a number of smaller changes which improved the pistol slightly from a manufacturing or aesthetic standpoint but did so without significant internal design changes. These smaller variations are noted but individually do not constitute distinctly separate Types. Total Model 9 production is estimated at around 250,000. Model 9 production volume was greatest in the early 1920s when the pistol was first introduced. During the first four years of production, from 1921 through around 1924, approximately 127,000 Type I Model 9’s were made. Then Walther made some significant changes to the pistol resulting in the Type II. Annual production volume fell off significantly and for the next 10 years, until around 1934, total production of Type II Model 9’s was approximately 108,000. 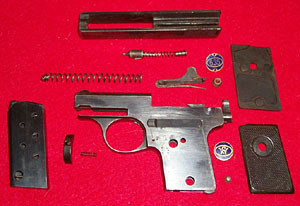 In 1934 or 1935 Walther again changed the design significantly, resulting in the Type III. Model 9 production appears to have picked up slightly in 1938, before World War II broke out in September 1939. During the rest of the war years of 1940 through 1945 Model 9 production was very limited. Total production of Type III Model 9’s from 1934 until the Walther factory was shut down in May of 1945 is approximately 15,000, the majority of which were made prior to 1940. Serial Number range: 410000 (1921) to 537xxx (1924). The recoil spring has a pointed metal pin mounted at the front which fits into a corresponding indentation in the front cross bar of the slide. The slot in the underside of the slide on the right side extends only ¾ of the way towards the rear of the slide. The 3-digit serial number on the slide is stamped on the underside of the slide behind the ejector slot. Grip retention is by blue enamel disks with brass. The left disk is attached with a screw from inside the magazine well. The right disk is attached to a threaded nut inside the frame using a small spanner wrench. The face of the left disk is marked with the “CW” monogram in an oval. The face of the right disk is marked with “6 .35”in an oval and has small holes for the spanner. Both grips are plain checkered black plastic panels with ribbed backs. The Serial Number is stamped horizontally on the right rear of frame. Crown over N proof marks are stamped sideways on the right side above trigger on the frame and directly above on slide. There is no magazine safety. The “cup” that retains the striker spring on the slide retention bolt is about 2mm deep and the edge of the “cup” is even with the front of the slide retention bolt. Note that the complete transition from Type I to Type II took place over a range of several thousand pieces, and aspects of both Type I and Type II can be found in this serial number range. The extractor slot in the chamber of the barrel is not open, but has a thin sheet of metal which covers the extractor where it protrudes into the rear of the chamber on SN 410000 to approx 425xxx, after which the remaining metal of the extractor slot is milled away leaving the extractor exposed. The sight groove is narrow (about 1.5mm) on SN 410000 to approx 503xxx, then the sight groove is widened (about 3mm). The trigger spring is a coil spring on SN 410000 to approximately 525xxx, after which a flat trigger spring is used. Serial Number range: approximately 537xxx (1924) to SN 640xxx (1934). The pointed metal pin is no longer present on the end of the recoil spring. There is a tab milled directly into the cross bar at the front of the slide into which the front of the recoil spring is fitted. The slot on the underside of the slide on the right side is cut almost the full length of the slide. The last three digits of the serial number are stamped on the front of slide atop the cross bar. Grip retention is by small exterior screws and decorative steel washers attached to threaded bushings that are pressed into the frame. The rear of the firing pin is lengthened by approx 1.5 mm beginning around SN 540xxx. This makes it easier to “feel” when the pistol is cocked. The serial number on the frame is stamped horizontally on right rear of frame up to approx SN 605xxx after which it is stamped on the left of frame downwards vertically behind the trigger through approximately SN 634xxx then on left of frame upwards vertically behind trigger. Standard plain checkered black grip panels transition into checkered black grip panels with a large WALTHER logo on each side. Note: from approx SN 545xxx to 558xxx black grips with a plain right panel and a small WALTHER logo on the left panel are seen intermittently. All grip panels have ribbed backs. During the Type II production period Walther offered an upgrade to the standard Model 9 pistol that was designated the Model 9b. The 9b had an upgraded finish that reverted to the more decorative Type I style enamel grip retention disks, and in most cases the slide had acid etched engraving. The enamel retention disks are usually blue, but some are white . These handsome pistols were sold for a modest up-charge. Other than the grip retention disks the Model 9b was mechanically the same as the Model 9 Type II. The Model 9b should not be confused with special order Model 9’s which had high grade engraving and/or special plating and/or custom grips which are discussed below. Serial Number range: approximately 641xxx to approximately 652xxx (1938) and then 190000N through 198xxxN (1940?). Magazine safety parts are added on right side of the frame behind the transfer bar. The grip frame is milled out to take the safety lever and a locking slot is milled into the transfer bar. The “cup” that retains the striker spring on slide retention bolt is milled to be shallow (about 1mm) at the top edge of the “cup”. The front edge is at an angle to the front of the slide retention bolt. Black checkered plastic grip panels with large Walther Logo on each grip have solid backs standard on all Type III. The grip retention by exterior screw and washer into threaded bushings pressed into frame are seen through SN approx 196xxxN then a new style of blue enamel retention disks attached through the magazine well is used. Crown over N proof marks are found on the right side of the frame above the trigger and directly above on the slide until approximately SN 196xxxN, after which Eagle over N proof marks are stamped in the same locations. There are examples of some very late production Model 9’s in which parts from all eras of production are assembled into complete pistols. These pistols appear to show that the Walther factory was using up all existing parts at the end of Model 9 production. It is not known exactly when Walther produced the last Model 9. It may have been as early as 1940, or possibly as late as 1945. Exact Model 9 production numbers and dates are no longer available. However, based upon the study of surviving examples it is possible to establish reasonable estimates of production quantities and dates. Throughout the entire production run Standard Model 9’s were available in either a high polish blue finish or with nickel plating. On a special order basis Walther offered high grade guns with custom finish options. In addition to the blue and nickel finish, gold and silver plating were offered. Walther’s famous high quality engraving service was also available. In addition, grips made of wood, ivory, or mother of pearl were options. Mechanically these beautiful Model 9’s were the same as the standard production type being made at the same time. High grade Model 9’s are seen in all types and variations. The Walther Firm was very active in marketing its fine products throughout the world in the period between WWI and WWII. On occasion Model 9 pistols will be found with various import markings required by different countries or added by retail outlets. These markings are found on all three Types of Model 9. Examples of these marks are tiny “MADE IN GERMANY” stamps indicating guns which were exported to the U.S.A., “VP over N” stamps with a serial number and a date stamped on pistols imported into Austria, a Rearing Lion with a serial number and a date stamped upon pistols imported into Czechoslovakia, and names and addresses of stores from San Francisco to Nairobi etched into the slide. Examples of exported Model 9 pistols are seen from the earliest 1921 production all the way until 1940. These markings add an interesting bit of personality to the guns that have them. The vast majority of Model 9 pistols seen in America do not have any import marks which implies that they were probably brought home from Europe by returning G.I.s who picked them up while serving during WWII. As with the Model 9 pistol, the magazines for these tiny guns evolved over time. The following outlines the various details of these magazines. Walther Model 9 magazines have a six round capacity. They measure about 57mm long. Each magazine has 5 viewing holes in each side. Model 9 Walther magazines are of an uncommon design in that they do not have the traditional extension on the baseplate for seating the magazine against the frame and for aiding in removal of the magazine. Instead Model 9s have a protrusion in the right side which seats against a stop milled in the side of the magazine well. All Walther-produced Model 9 magazines have a hole in the lower left side which allowed the stamping of the protrusion on the right side through the magazine. At the bottom of the magazine face there is a narrow “fingernail” groove for aiding in extraction of the magazine from the pistol. As with the Model 9 pistol, magazines are found in a variety of finishes. Blued, nickel, gold, gold wash. In most cases, but not all, the finish on the magazine matches the finish on the pistol. 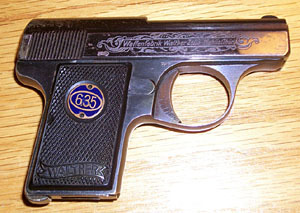 There are instances where blued magazines were issued with nickel guns, and nickel magazines were issued with blued guns. There are three variations of the base on Walther Model 9 magazines. 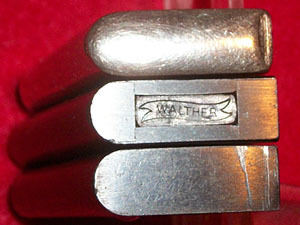 The three variations are: Plain, flat bottom; plain, rounded bottom; and Walther logo marked bottom. The earliest Model 9s have plain, unmarked flat bottoms. These early plain, flat bottom magazines are typically observed with Type I Model 9s from the beginning serial number of 410000 up through around 436XXX. Plain, flat bottom magazines do show up occasionally in later production pistols with high grade and/or engraved finishes. Flat bottom magazines are found in all finishes. There is a short span of Type I pistols from Serial Number 438XXX through around 446XXX where Model 9 magazines with a plain, unmarked, and slightly rounded bottom are seen. All of these odd magazines are nickel finish. They are found with blued pistols as well as nickel finished pistols. These magazines cease to be seen with any later production pistols. The third and by far the most common Model 9 magazine bottom is stamped with the WALTHER banner logo. These magazines begin to show up on Type I pistols around serial number 438XXX and are seen throughout the balance Type I, Type II and Type III Model 9 production. WALTHER logo marked magazines are seen in all types of finish. There are also three variations of follower used in Model 9 magazines. The three types of Model 9 magazine follower are: Swaged, rounded followers which appear identical to followers used with the Model 8. Flat stamped followers with an exposed front that does not cover the front of the magazine spring. The third type of follower is stamped with a front that bends over the front of the magazine spring. 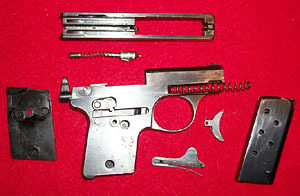 Swaged followers are seen on magazines with flat bottoms and with WALTHER logo bottoms. 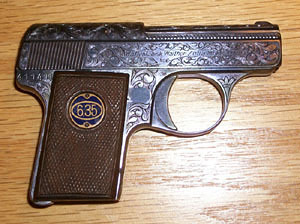 Swaged followers are more common in earlier pistols. The second type of follower that is flat, stamped steel and does not cover the magazine spring is the most common and is seen on magazines with all three types of bottom. All of the rounded bottom nickel finish magazines observed have this second type of follower. This type of follower is far less common on very late production pistols. 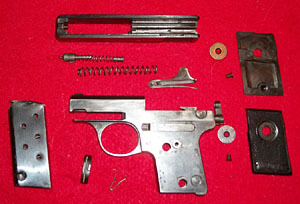 The third type of follower that is flat, stamped steel with the front that covers the magazine spring is generally seen on magazines issued with late production Model 9 pistols. 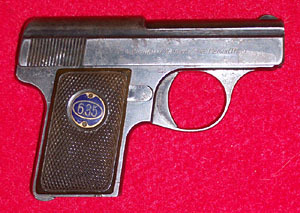 This type of follower is seen with almost all Type III Model 9 pistols. Copyright 2011 by Earl Mount. All rights reserved.